REA has Your Rx for the MCAT CBT! 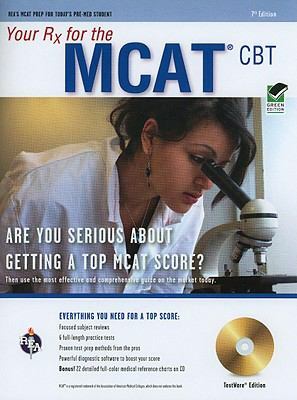 Master the MCAT and Get a Top Score! Includes Bonus Visual Medical Reference Library! If you've always dreamed about getting into a top medical school and having a rewarding healthcare career, REA has Your Rx for the MCAT CBT ! This fully revised edition of our popular test prep is completely aligned with the official computer-based Medical College Admission Test (MCAT). Prepared by a veteran of the MCAT testing experience, our test prep gives medical school candidates an in-depth review of every must-know topic covered on the MCAT , including Verbal Reasoning, Writing, Biology, Mathematics, Physics, Chemistry, and Organic Chemistry. Each chapter includes practice questions with solutions, so you can test your knowledge as you study. Six full-length practice tests featured in the book are based on official MCAT CBT exams . Each test is balanced to include every subject and type of question you can expect on the actual MCAT. Two of the book's practice tests appear on our TestWare CD. Each test is given in a timed format with instant, automatic scoring analysis and detailed explanations of answers. We don't just say which answers are right, we explain why the other answer choices are wrong ' so you can identify your strengths and weaknesses before test day! The test prep comes complete with a progressive 12-week study schedule, numerous illustrations and diagrams, and expert test tips and strategies that build test-day confidence. Get an extra study advantage with our Visual Medical Reference Library (included on CD). Each full-color chart focuses on a specific subject and is the perfect way to review anatomy and physiology topics. These 22 charts offer extra review and vital medical information you need to know for exam day! If you're serious about getting into medical school, REA has Your Rx for the MCAT!Research and Education Association Staff is the author of 'Your Rx for the MCAT CBT 7th Ed. w/CD (REA) (TESTware)', published 2010 under ISBN 9780738603872 and ISBN 0738603872. Loading marketplace prices 6 copies from $2.06 How does the rental process work?